How Do You Become an ICU Nurse? If you are interested in working for intensive care, cardiac care, neonatal intensive care, or pediatric intensive care units, then it is truly the perfect time to become an ICU nurse. Since hospitals nationwide are constantly demanding more quality ICU nurses to run their intensive care units, nurses with ICU experience usually have the easiest time finding a job, according to Modern Medicine. There are currently more than 500,000 critical care nurses employed throughout the United States, but this number is only expected to grow as hospitals are asked to treat even more acutely ill patients. 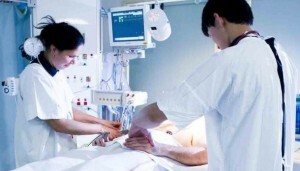 In order to develop the unique set of knowledge and abilities that is needed for critical care settings, the following is a step-by-step guide on how you can become an ICU nurse. nutrition, chemistry, microbiology, health assessment, and behavioral sciences, bachelor’s degree programs incorporate liberal arts curriculum for a more well-rounded education. In order to receive the most comprehensive training and clinical experiences, it is typically recommended that ICU nurses receive at least a Bachelor of Science in Nursing for the best job prospects. Once you have graduated from an accredited degree program in nursing, you will need to apply for state licensure as a registered nurse to legally practice in any healthcare setting. While licensing requirements tend to vary from state to state, most will require registered nurses to have good academic standing, submit an application, pass a criminal background check, and receive a passing score on the National Council Licensure Examination (NCLEX-RN). In order to find out the specific requirements in your location, contact your state’s board of nursing. Before moving on to the next step, you will need to begin working in acute care settings to build practical skills and hands-on experiences evaluating patients with critical medical concerns. Within the hospital’s ICU unit, entry-level registered nurses are typically involved in reviewing patients’ medical histories, taking vital signs, administering medications, reading cardiac rhythms, using medical equipment, and implementing care. You will want to gain extensive experience in these critical care settings by treating patients with a variety of acute problems, ranging from traumatic injury and heart attack to respiratory failure and sepsis. Although certification is strictly voluntary, it is highly recommended that ICU nurses become certified to demonstrate their professional accountability and commitment to lifelong learning for the best career advancement opportunities. Through the American Association of Critical Care Nurses, registered nurses can become certified in Acute/Critical Care Nursing as a CCRN or in Tele-ICU Acute/Critical Care Nursing as a CCRN-E. Applicants must have an unencumbered RN license, have at least 2,000 hours in direct bedside care for acutely ill patients, and pass a three-hour test containing 150 multiple-choice questions. Overall, critical care nursing is a fast-paced specialty area that deals specifically with acutely and critically ill patients with potentially life-threatening problems. Using this step-by-step guide on how to become an ICU nurse, you will receive the credentials needed to work in various critical care settings in order to provide the high-intensity interventions needed to save lives.